You may (or may not) remember the cookbook challenge — my wife challenged me to make one recipe out of each cookbook in my library before the end of 2014, or forfeit the cookbook. The challenge is done and I have not been as diligently recording it as I should have. However, I have this old post that I had meant to make back in July when I cooked it last. Channa Saag is the dish I credit with getting me to eat spinach. I don’t like spinach. The smell, the bitter taste, it’s just not something I enjoy. However, when it’s pureed with spices and garlic and ginger and cream, it’s delicious. Perhaps it’s not so important that it’s spinach at that point. It could be any dark leafy green. Heck, it could be cardboard (well, maybe not). Indeed, while most Indian restaurants will have you believe that “saag” = “spinach”, this isn’t strictly true. Saag is a method of preparing greens, and a dish made that way. As a matter of fact, the saag I like to make in my slow-cooker is half spinach, half mustard greens. Also, you might be forgiven for thinking that it’s a healthy dish, so loaded with greens and garlic and ginger. But most of the time, it’s sauteed in ghee and finished with cream. It’s a fairly decadent dish, really. Which is why the prospect of making it in a 6-quart slow cooker is kind of terrifying. Oh, and channa? Those are chickpeas, garbanzo beans, whatever you call them. In India, they use a slightly different species that’s smaller and darker — but it’s easier to get the canned ones for this purpose. As much as I like decadent food, I also know that I can’t afford to eat too much of it at one time. 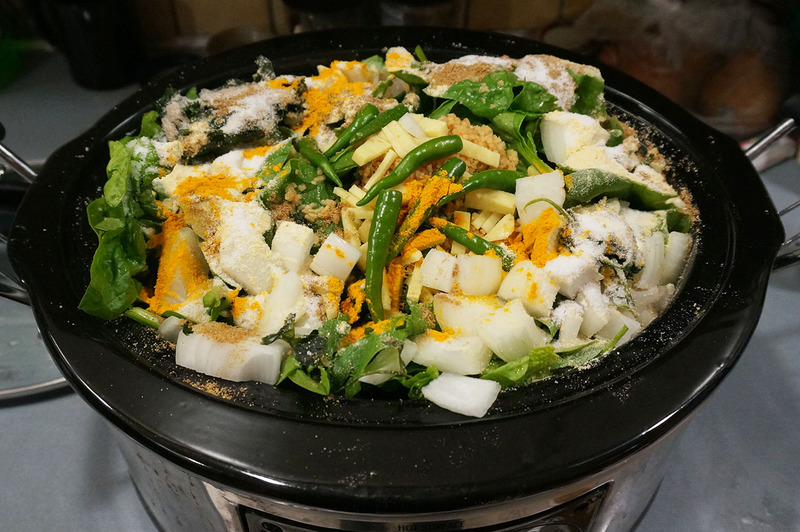 Which is why I love The Indian Slow Cooker by Anupy Singla. See, here’s the thing about slow-cooking. Sure, it takes longer — but you can get the effects of frying things in butter and oil without the butter or oil. The saag recipe I used is vegan, for heaven’s sake. Not that I care about that, but it does make it easier to take to potlucks. Sad to say, I don’t have any photos of it after it’s done. But you can imagine a mottled deep green paste with little flesh-colored balls floating around in it. Not the most appetizing image in the world — but so tasty! Put all the ingredients except the garam masala and chickpeas in a 5 or 6-quart slow cooker. Cover and cook on high for 6 hours. Puree the resulting “mush” with an immersion blender (or dump it in a heat-tolerant blender with a little extra water if necessary, puree and return to the pot). Add the garam masala and the chickpeas and cook on low for 1 more hour. That’s all! Add salt to taste (I’ve never found it needs any more than this) and enjoy over rice, cornbread or with fresh-made rotis. If you give this a shot and love it, I highly recommend you grab the book and try some others! Last year, when my friend Guido joined the Somerville Chocolate CSA for their first season, I was intrigued but unsure if I could really justify purchasing such quantities of chocolate. I’ll also admit that I found the sole pickup point at the top of Winter Hill a little daunting as well. While I have no problem pedaling up that hill in the summer (at least, every now and then, not daily), the prospect of getting up there in the winter was not something I relished the idea of. But like any successful CSA, they have expanded their pickup points and one of them was in my neighborhood, at Central Bottle. I could no longer resist. The proprietor of this amazing venture is one Eric Parkes, brother to the singular Clara Parkes whose unparalleled knowledge of all things fiber and yarn and knitting (not to mention baking, and those caramels …) has endeared her to the knitting world forever and ever, amen. But where was I? Clearly the genius runs in the family, for Eric is doing with chocolate what Clara has done with yarn. He’s starting from the very beginning, almost — getting cacao beans shipped from all over the world and experimenting with different ways to process them, then charging a hundred or so willing guinea-pigs for the privilege of being his test subjects. He came to the Common Cod’s latest Ignite event and gave a talk about his CSA … which, since I was there, was probably the thing that sealed the deal for me. You can check it out here — it’s only 5 minutes. So in the interest of enticing you to perhaps join me in this adventure — for I think that there are still shares available in this season, if not for much longer — I’m going to try to give you a sense of the three bars in Season 2, Harvest 1. Once upon a time I fancied myself something of a supertaster — I could pick individual ingredients and spices out of a dish by taste alone. I’m out of practice but I haven’t completely lost the knack. The bars are sorted by origin — Peru, Venezuela, Ghana — but also by cacao varietal. You can read up on the varietals first if you like. 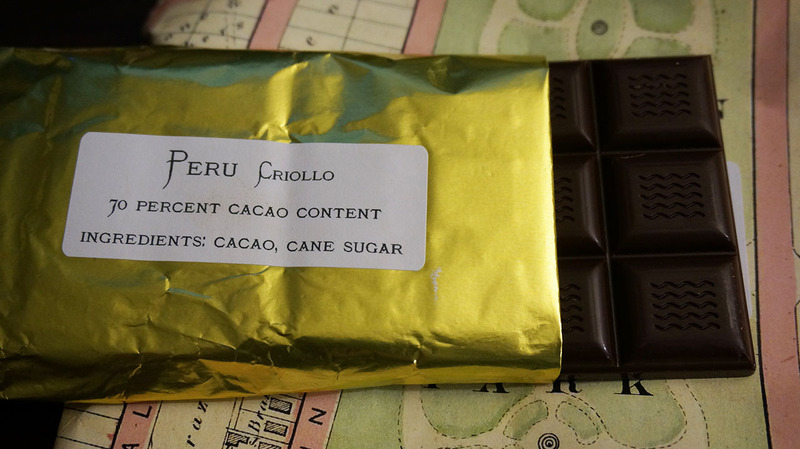 Peruvian Criollo: This is my least favorite of the bars in this harvest, so I’m starting with it. The mouthfeel is sort of grainy, similar to Taza’s trademark texture. Interestingly enough, I understand that Taza uses mostly Peruvian chocolate as well. I’m fairly sure that’s a coincidence — or perhaps not? I assume the graininess is a function of the tempering process, but could it be endemic to this particular cacao bean varietal? Aside from the mouthfeel, the flavor is sort of unremarkable. There’s something between a tangy first taste and a bitter aftertaste, but that’s as far as I can taste. One thing it does have going for it — it’s not too dry, which I appreciate in a dark chocolate. 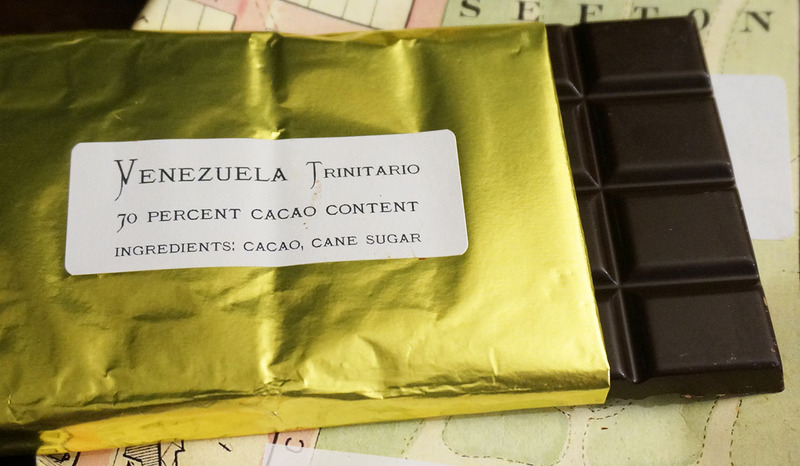 Venezuelan Trinitario: This one had me looking back at the label a couple of times to check the ingredients — nope, still just cacao and sugar, and 70% at that. It really tastes like a dark milk chocolate — very smooth, no bitterness at all, very sweet but most surprisingly, the distinct flavor of roasted nuts. I had to eat a couple of squares (quelle horreur!) to pick it out but I think the flavors are reminiscent of something between roasted almond and roasted hazelnut — but not overwhelmingly so. 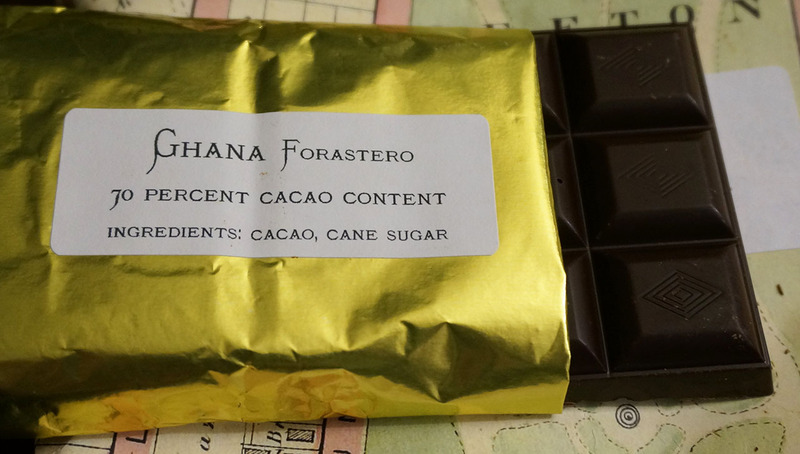 Ghanaian Forastero: Finally, my favorite of the bunch. This bar is reminiscent of dark spices and has a pleasant, fruity tang with the occasional burst of something tropical I can’t quite define. The mouthfeel is very smooth but this is definitely a dark chocolate, not like the near-milky smoothness of the Trinitario. With a flavor like this, I can forgive the brut quality that leaves me wanting a little something to drink right after finishing it. I feel I should come clean — I actually picked up this harvest about a month ago. I have been alternately sick or busy since then and haven’t had time or the functioning taste buds to review these. I have already picked up Harvest 2, and hope to do something similar with that soon — so keep an eye out! Every summer since I met my lovely wife, we’ve taken a few days to visit her family’s home-away-from-home in Wells, Maine. They rent a beach house out on the sandbar for a week or two and invite the family to come up. We have to rotate through because it’s not a very big house, but we’ll generally try to get there while some other family is around, since it’s nice to see family outside of the usual holidays and birthdays that usually bring us together. In recent years, we’ve made an effort to visit Spiller Farm while we’re there. This is a kind of unique farmstand (think fresh local veggies, imported watermelons, and lobsters in tanks) that has a pick-your-own component as well. When we get there, it’s usually pick-your-own highbush blueberries, among other things — we’ve gotten corn, carrots, tomatoes as well as the usual fruits in the past. We make a point of picking lots and lots of blueberries — about a gallon, if we can. 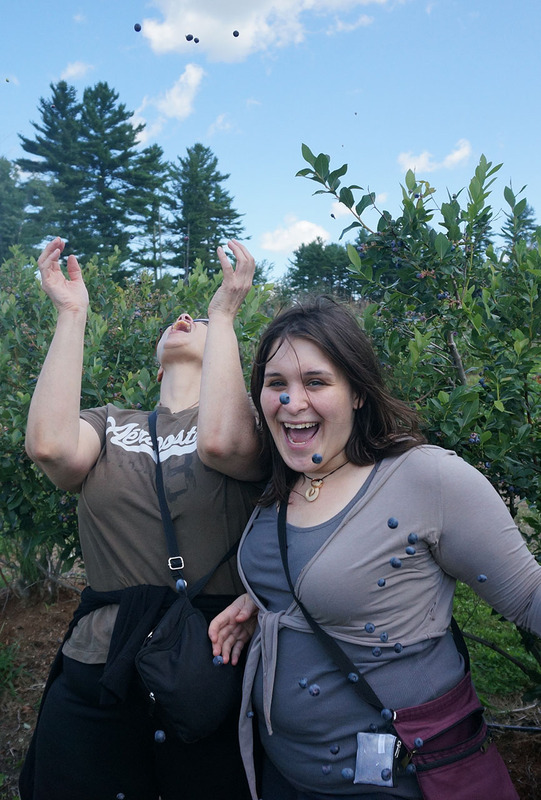 Of course, many blueberries are eaten in the process, and occasionally we just throw them up in the air and try to catch them in our mouths. When we get back from Wells, I pack the blueberries up into 2-cup servings in freezer bags and freeze them. It may be months before I get around to using them but they’re still delicious. 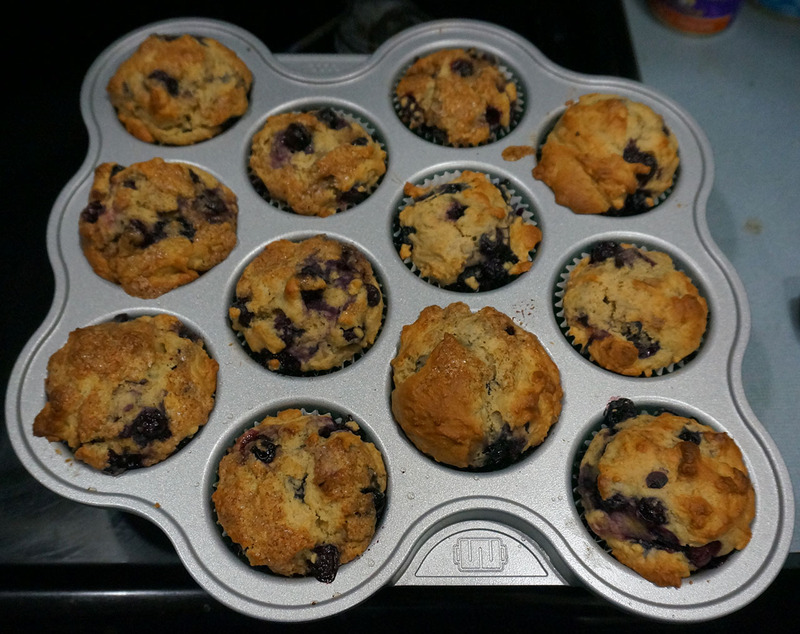 Recently, we had a houseguest staying with us, and I decided I’d up my breakfast game and make some muffins. So I entered the cookbook challenge again. This time, I’m using a book called “Mad About Muffins“. There are great recipes — from basic bran muffins to “Taco Muffins” that use salsa and meat drippings. But for now, as you can probably imagine, I’m sticking with a basic, classic blueberry muffin. Caveat: I don’t know the rules about posting recipes out of someone’s cookbook, but I’m going to hope that if I’m doing it in the pursuit of promoting their cookbook they’ll be OK with it. However, this recipe is written more narratively and also has some tweaks that make it a little different (but not a lot). Nevertheless, if I get a C&D order I’ll have to take it down. Heat your oven to 375 degrees. Soften 3/4 stick of salted butter and mix with 2/3 cup of sugar (I use Florida Crystals or some other fine-grain minimally-processed sugar) until well combined. Beat in 2 eggs. Add a teaspoon of vanilla extract (I recommend Penzey’s if you can get your hands on it), and 2 teaspoons of baking powder. Add a cup of all-purpose flour, mix in. Add 1/4 cup of milk, mix in. Add another cup of flour and another 1/4 cup of milk, as well as 2 cups of blueberries fresh from the bush — or the freezer — and mix until just combined. Try not to crush the blueberries too much. Grease a muffin tin (or use muffin cups, which is what I did) and evenly distribute the mixture into 12 muffin-shaped depressions. Finally, take 1/4 stick of softened butter and mix with 2 tbsp of cinnamon sugar (or 2 tbsp of brown sugar mixed with 1/4 tsp of cinnamon). The recipe calls for 1/2 cup of chopped walnuts as well but if you don’t have any, just double the butter/sugar mixture (1/2 stick of butter and 4tbsp of cinnamon sugar). Put a dollop of the mixture on each muffin and bake them for 25-30 minutes. The muffins turned out great, and were gone within 24 hours. We have no self-control, evidently. The stuff that was supposed to be streusel topping just ended up giving each muffin a slight sugary glaze. This was also the first test of the Baker’s Edge pan I got last Christmas. Why, you ask? I have no idea. It’s just a well-made muffin pan; the company claims the shape is good for something but I think it’s just an interesting gimmick to set them apart from other kitchenware makers. Since they’re well made, I don’t mind buying into the gimmick. I really love their brownie pan too, but I like edges so it makes sense. 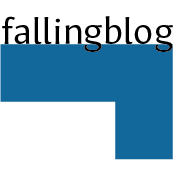 I’ve got more food posts lined up, so keep an eye on this space. If you’ve spent much time around me and food has come up in the conversation, you probably know I have a passion for Indian food. Once upon a time, I set out to try every Indian buffet in the Boston area (there are over 50 accessible by the T, to say nothing of those accessible by the bus system) and documented my findings on a short-lived blog called “The Phantom Buffet”. During my journeys, I got to try all sorts of new dishes (and compare some ubiquitous dishes, served at almost every buffet). Prior to that journey, however, I had spent 4 years in Maine as a cook at 2 well-regarded restaurants in a town full of good restaurants (and not just the seafood variety). I got pretty good, and some of the dishes I designed for one restaurant remain on the menu today. So, as I wound down on the Indian buffet venture, I began to work on reproducing some of the dishes I enjoyed most. Some are too far from realistic for a home cook (I hope someday to have a kitchen with a tandoor, but not today) but others are eminently doable. Through several cookbooks, I have tried many recipes and discovered more and less successful ways of doing some of my favorite dishes, and have approached restaurant-quality meals in some cases. Last week, I finally decided to tackle an elusive favorite dish which I had yet to discover a viable recipe for: Jeera Aloo (and its delectable cousin, Methi Aloo). The dish is simple in concept but less so in execution. Basically, they’re Indian homefries with whole spices and a really complex flavor that’s soaked up by perfectly-cooked potatoes. There are some complications: First, “perfectly-cooked” potatoes are hard to do. Mashed is easy, undercooking is woefully simple, but getting nicely-formed cubes that are fully cooked without being mushy is difficult. Second, getting the right flavor is hard because you can’t taste the potatoes until it’s too late to re-season them. Enter the Spice Bible. This is a book I was gifted some years ago and have glanced at but never really used. It’s unique in that it organizes its recipes by the dominant spice in the recipe. It also goes into some unusual spice mixes and pastes toward the end. And under one of those mixes, I found my recipe. 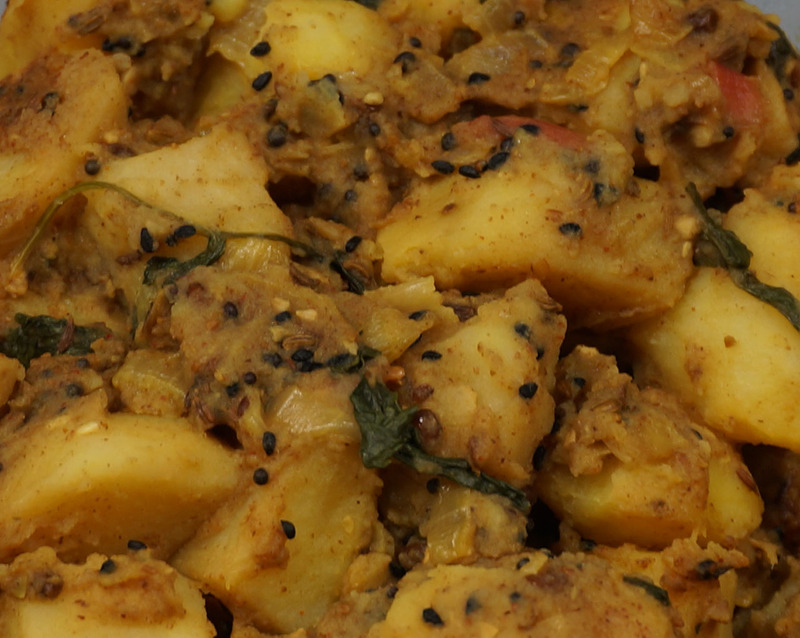 Panch Phora Aloo is a dish very much like Jeera Aloo, but with a more complex flavor palette. Instead of just jeera (cumin), it uses a spice mix consisting of cumin, fennel, fenugreek, nigella and black mustard seeds (in equal amounts). It also uses copious quantities of ghee. The first batch I made I followed the directions on but didn’t think too hard about seasoning. Salt would have been important but I didn’t use it until it was too late. The spice balance and heat level was good but salt brings the flavors to the forefront and the result was an unevenly-flavored dish that I was convinced I could do better. I took a risk. Last Tuesday I had heard some old friends were all coming to the Tuesday Night Dinner — a potluck at the home of another old friend. When I can make it, people know that whatever I have to offer will be one of everyone’s favorites and the host will probably end up scraping the bottom of the dish and eating it right off the serving spoon. So I had to do it right. I changed one thing about the recipe: after sauteeing the panch phora and onions until nicely browned and fragrant, I added a liberal quantity of salt (about half the amount of whole spices) at the same time as adding the powdered turmeric, freshly-roasted and ground cumin and chili powder. This made the oily paste (sounds appetizing, right?) extra salty and flavorful just before adding the parboiled potato cubes and garlic. The naturally bland potatoes and the oversalted sauce combined to create — voila! — a perfectly-seasoned dish. After sauteeing for 15 or 20 minutes, the potatoes cut nicely and a taste test confirmed all was well. A bit of lime juice and cilantro tossed in at the last minute and the dish was ready. At the Tuesday Night Dinner, it was one of only a handful of vegetarian dishes and therefore much appreciated by the handful of vegetarians — but lauded by many others as well. In the end, the score was Potluck: 1; Cookbook Challenge: 1; Phantom Buffet: 0. That’s one more dish I don’t need to search out on the buffets and menus of Boston — now I can do it myself just as well or better! I hope you enjoy my culinary adventures. Remember, if you want to turn these off and just read my music or knitting content, use the “Choose Your Own Adventure” floater to your right. My lovely wife just passed a milestone (it’s like passing a kidney stone, but less painful). As of yesterday, she’s joined me in the 30-something crowd. Some years back when I did the same thing, she planned an ingenious surprise party for me, managing to get old friends of mine to travel in from several states away. Her original idea, however, was even more ingenious — to do a Logan’s Run themed 30th birthday party. 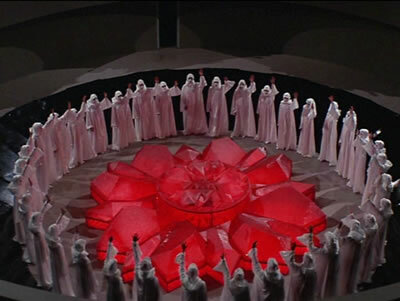 Spoiler Alert: For those who haven’t seen Logan’s Run, and enjoy campy 80’s sci-fi B-movies, I recommend it. But if you don’t want to sully your pristine mind with such things, I’ll tell you the basic plot. There’s an isolated underground society where everyone is under 30 years old. When they reach 30, they participate in a ritual called the Carousel, where they ascend to a higher plane or some such. Of course, someone in the society figures out that the computer in charge of all this is just killing them off. His name is Logan, and of course on his 30th birthday, he runs rather than subjecting himself to the Carousel. The Carousel itself looks like a giant red modernist jello-mold or, more relevant here, a bundt cake. So the idea was to bake a cake using a sufficiently-geometric bundt pan, and maybe get all our friends together in white robes and fly around above the cake before exploding in showers of bad special-effects. Or, you know, just eat cake. Anyway, on her 30th birthday I also failed to get a Logan’s Run-themed party together — partially because I am not a good party planner and partially because she had already planned something equally awesome for herself. However, as the day approached, I figured I could at least bake an appropriate cake. I am, after all, the chef in the family. 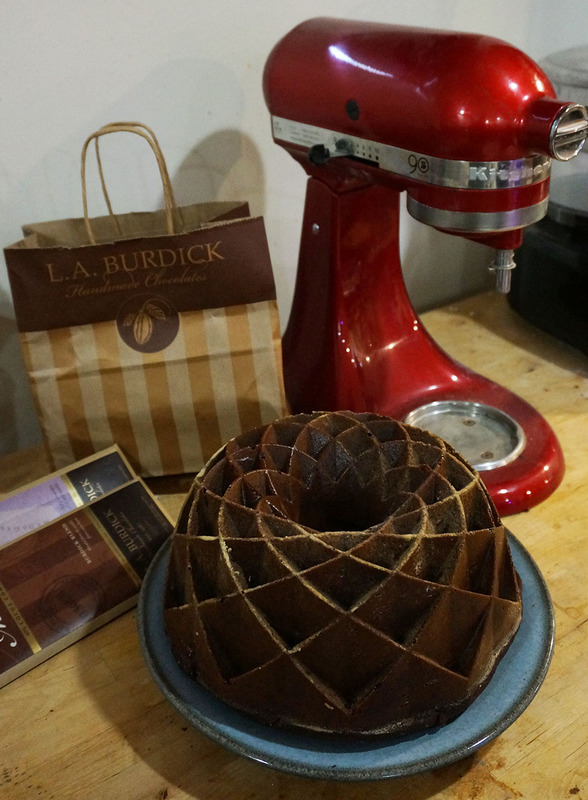 I had a devil of a time, however, finding an appropriate bundt pan. I feel like, some years ago, such a thing existed. But some bundt designs are timeless and some are less so, and it appeared the one that looked like the Carousel had reached its 30th birthday and expired. So instead, I went with clean, beautiful, awesome geometry, like what might have been if Logan’s Run had been remade in the modern era (don’t do it, Hollywood! Please don’t!). I bought the Nordicware Jubilee pan, admittedly one of the more difficult bundt shapes to get right, and hoped for the best. I figured I’d have the best luck with a King Arthur Flour recipe, and I dug around on their site until I found this one. I had some other errands to run so I went out and fetched some high-quality baking cocoa from Burdick’s and some real Maraschino cherries from Cardullo’s. I already had a bag of mixed dried cherries from my recent trip to Seattle. While my wife was out on an errand of her own, I whipped up the recipe and tossed it in the oven. The recipe was for a 12-cup bundt pan, and the Jubilee is a 10-cup design (probably due to all the lost space from the geometric spikes) so I was afraid I overfilled it — but while it did overflow a bit, it didn’t make a mess and only took an extra 20 minutes in the oven to get to the right consistency. After some cooling time, I loosened the bottom, flipped it onto a plate and voila! it worked perfectly the first time! The next issue was frosting. I wanted a lurid red glaze, but it had to be opaque enough so that the chocolate cake underneath didn’t show through. Some research indicated that red glaze is next to impossible if you also want the flavor to be good — too much food coloring makes the glaze bitter and the Maraschino liqueur I was using isn’t actually bright red like the artificial stuff you usually see. So I settled for pink and good flavor rather than red awfulness. Regardless, the glaze pools in the indentations and even if the resulting cake doesn’t look as beautiful as the one fresh out of the pan — and certainly doesn’t resemble the Carousel very much — it’s going to taste awesome. 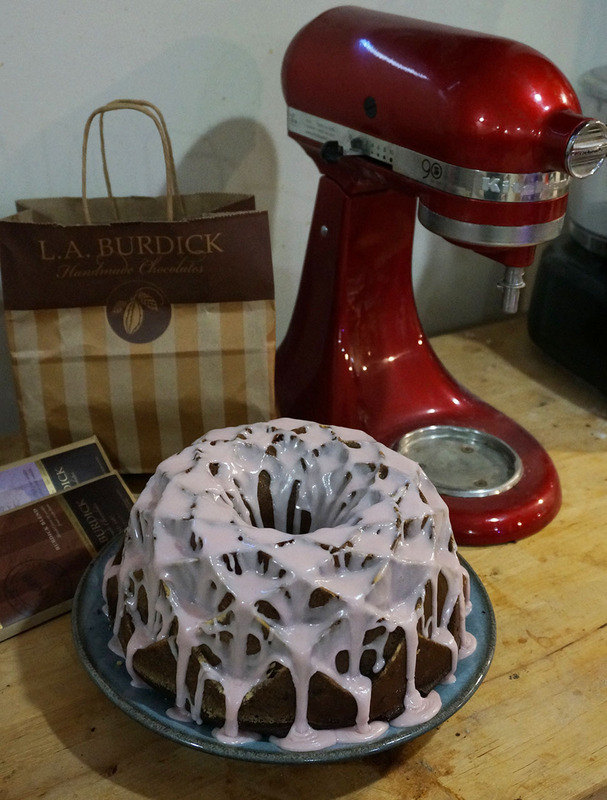 So I give you: Alasdair’s Quintuple-Cherry Chocolate Bundt Cake! We’ll report on flavor in the comments. Anyone else ever done any interesting Bundt shapes? A new tradition? Grandson's Apple Pie. Well, in an attempt to branch out in my definition of art and/or craft, I want to make sure I post some things other than knitting in here. 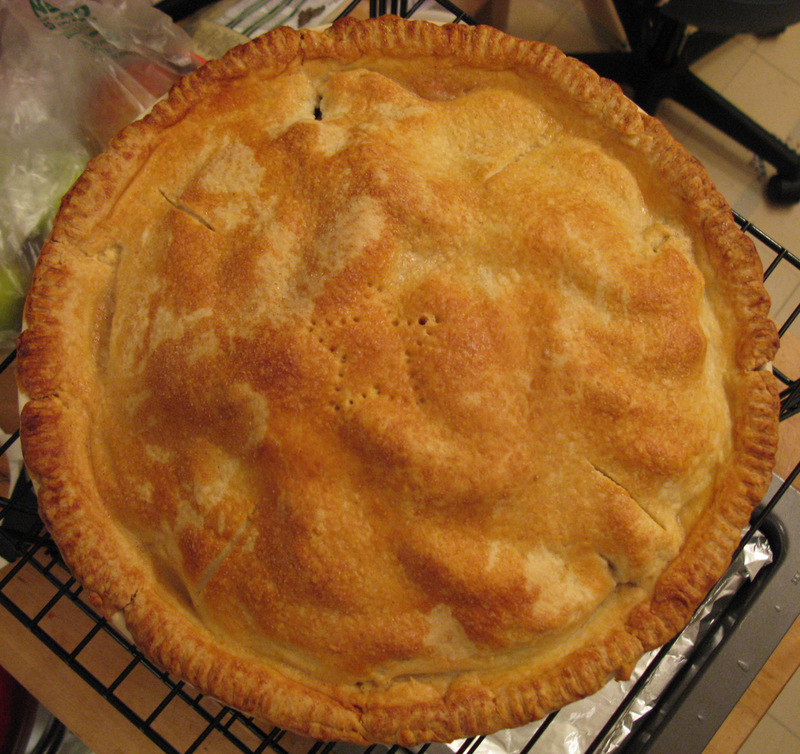 Case in point, here’s a pie I baked for my family’s Thanksgiving. My grandmother has traditionally been the pie-baker in the family, and everyone has fond memories of her pies. But it’s been a while since she’s had a real functional kitchen for baking since she spends her winters at an assisted living facility, and I offered to make the pie for this year’s gathering out in Western Mass. I’m really happy with the way it came out; it reminds me of the pies my mother made, but with my own touches — like the fact that it’s made in a huge ceramic deep-dish pan. This is only one of two I made — because after coming back from Thanksgiving proper, my wife’s family had Thanksgiving dinner on Saturday. I made another pie then (all this with apples picked up for a song at one of the last farmers’ markets of the season) and was made to promise I would bake another one for Christmas. Twist my arm! I made these with this neat flour called Ultragrain and made the latest with Earth Balance shortening, which impressed me so much that I threw out the remainder of my Crisco.